Survivors of HG publish new books. Download the FREE Acrobat Reader from Adobe to allow you to view these and many other great PDF's all over the web. The Dr. Phil show aired on April 12th 2007 and we want to thank all of you who watched as hyperemesis gravidarum (HG) was given a national stage, thanks to Dr. Phil and his staff. Now we need to keep the momentum going and let our voices be heard! Please email Dr. Phil and tell him and his producers "thank you" and how an entire show dedicated to the topic of HG should be on his schedule for next season. Tell him your story and how HG has changed your life. Make sure your friends and family members join in and write in as well. Remember "Together we are heard, alone we are silent!" Plus go on Dr. Phil's website and join in on the message boards about the show talking about HG. These boards are watched closely by the producers, so the more they see people discussing HG the better. The Founders of the HER Foundation meet Dr. Phil to thank him for helping inform the public about hyperemesis. 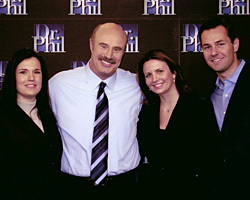 From left to right, Kimber MacGibbon, Dr. Phil McGraw, Ann Marie King and Jeremy King.